My brand new housemate piped up, incredulously, over his steaming hot cup of strong coffee whilst sniffing at the strong rich caffeine fumes. It was early on Saturday morning on the August Bank Holiday weekend and it was probably not the best news to have given him before he had his daily espresso drink. I gave him a flash of my winning smile and carried on munching on my breakfast bar. Ross had just asked me what I was doing for a day trip out the next day, and I told him of a place where I’ve always wanted to visit ever since I opened my very first history book at the age of five. Hastings is where British history is agreed to have started with the invasion of the Normans in 1066. (I dispute this as there is Anglo-Saxon and Viking history long before that date) but really, 1066, is when many children across the UK study from marking the time of William the Conqueror who set foot on these shores before battling King Harold Godwinson at Battle close by. He grumbled as he slowly drank whilst giving me a fixed stare. I began to explain to him my reasons why particularly on the historical side. I cheekily bantered and avoided his throw of a cushion as I skipped, laughing back to my room to read up more on 1066 country. Waking up as early as I could on a Sunday (what? It’s rest day! ), I headed over to London Victoria to undertake my two hour journey (costing £20 day return with my disabled railcard) with SouthEastern railways. 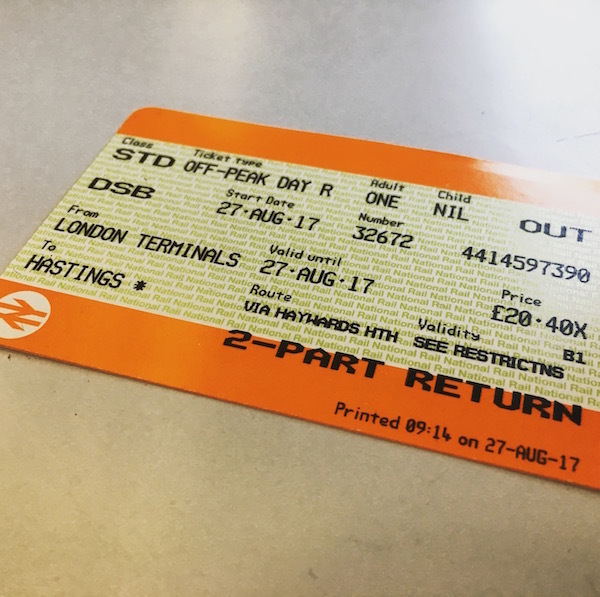 Taking a fast train to Tonbridge, I remained in my carriage while the train split, the front going to Dover and the rear going to Hastings. 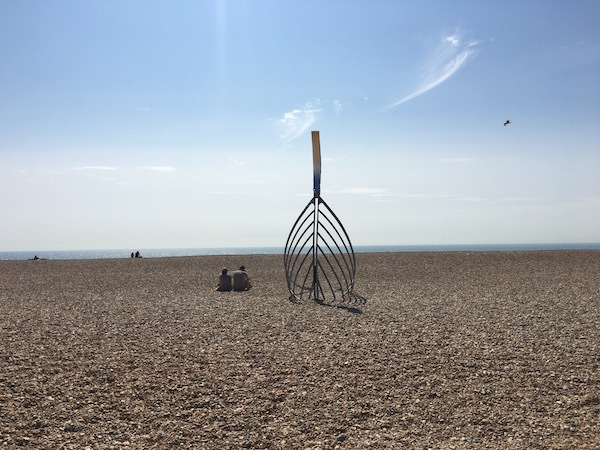 It was rather a pleasant fast journey and I eagerly awaited to explore this beautiful corner of England, but I couldn’t prepare for the immense surprise how pretty Hastings is. Blinking in the scorching sun at 11 in the morning, I stepped out of the train station and slowly ambled my way downhill towards the beachfront taking in the sights. Oooh, this is where I spent most of my time in Hastings. Offering great views of the city and the sea, Hastings Pier feels absolutely brand new. 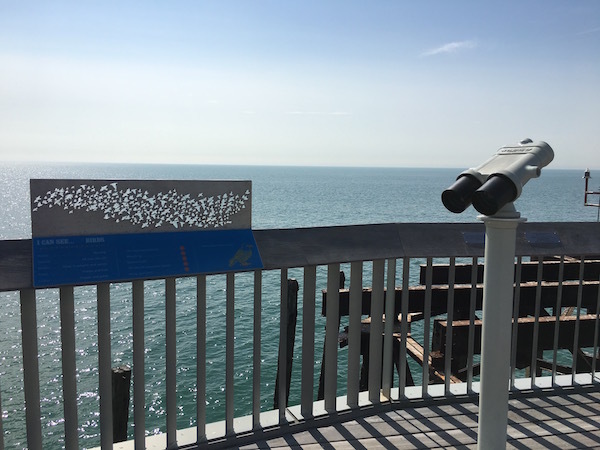 That’s right, as it rebuilt and re-opened to the public in Spring 2016 after a series of calamities that hit the old pier including storms, fires and more. 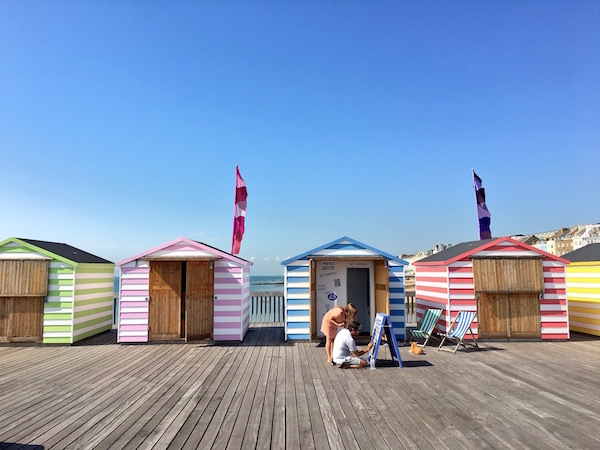 Walking on the wooden floor, my footsteps echoed as I strode right to the end, but not before checking out some beauties including these gorgeously colourful beach huts. But you do get a sense that Hastings Pier is actually bigger than it looks. Turning back around, I could see Hastings in all its glory. And you can even see out to the sea using the sea binoculars at the end. Will you see a new batch of Normans coming? I was told that Boyzone performed here the night before. Imagine how devastated I was to miss them! But if you need a refreshing break after walking alongside this tardis of a pier, I recommend sampling a local beer in The Pavilion Restaurant and Bar near the entrance of the pier and take in the views outside. You can see I’m happy with a big grin on my sweaty face! Gingerly stepping onto the rocky stone beach, I soon grew accustomed to there being no sand and actually rather liked it (no more finding sand in your pants days after!). Paddling in the sea was such a refreshing experience that I confess I fist pumped in the air, startling a lovestruck couple canoodling nearby. Spying the Norman castle on the hill from the beach, I knew what I came to Hastings for: to step foot in the very first Norman castle in the UK. But it’s on top of a MASSIVE hill and after shamelessly relaxing on the pier and the beach, I wondered how I would get the strength to walk up. But there’s a solution! The West Hill Cliff Railway Funicular! 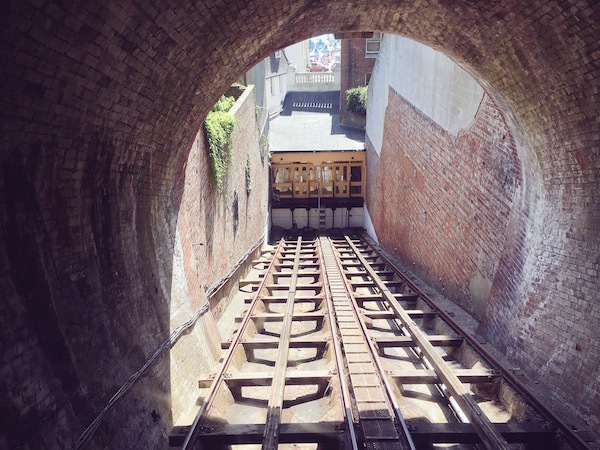 With £2.70 a trip, you pay the quirky Victorian style gate toll and clamber aboard the wooden carriage that will transport you up through a dark tunnel right all the way to the top. It’s a great experience and the families absolutely loved seeing their kids get enthralled by the journey. Definitely one to do in Hastings! After the funicular journey, you’ll be astounded by the views over Hastings, in the distance, Beachy Head, where I was a couple of years ago. After all that hungry work, you’re best treating yourself to an ice cream here to spoil yourself. 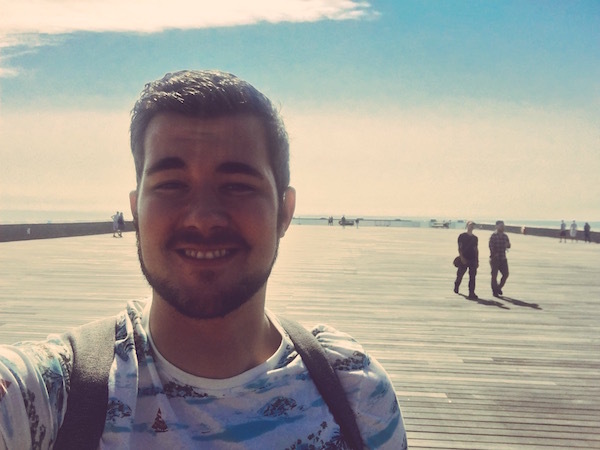 So, here I am! I made it! Taking a wild path through the wild flowers, I have arrived at Hastings Castle! With £4.70 entry, you can find out all about the history of Hastings and how 1066 was an important year in British history. It was all rather romantic, I have to say. 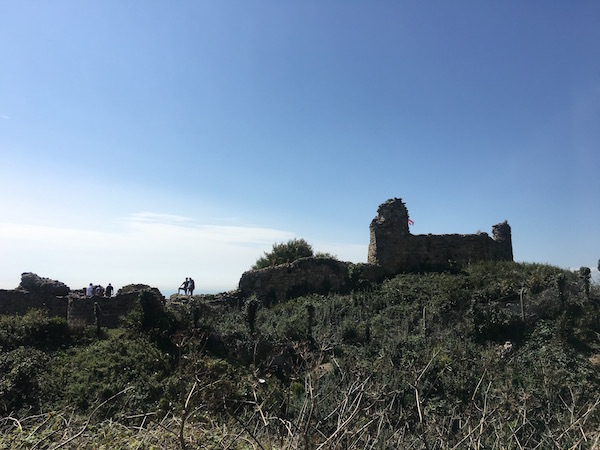 With a strong breeze on top, I could perch my foot on the stone and bend the knee to look across the English channel with a serious brooding look on my face. That was until a group of lads starting guffawing at my posture. But little did they know I would have looked AWESOME with a cape! 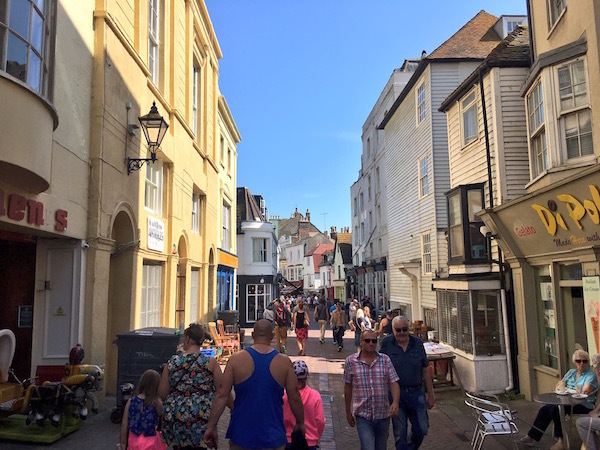 Avoiding the touristy areas of the arcades and funfairs back down on sea level, I took a detour into Hastings Old Town. Quaint, charming and pretty, it was a shopper’s paradise with independent shops and antiques stories that you can play with their knick knacks. It took all of my energy not to buy EVERYTHING. Right, after all this walking around, I was truly starving! With my vegetarian diet in full swing, I wanted to find a restaurant in the Old Town that served fresh produce and make my eyes as big as dinner plates. Enter the Fig Rye. It seems they have opened this second restaurant of theirs in Hastings as the main restaurant is in the town of Rye further along the coast. I entered this cool, happening and trendy restaurant staffed with suave waiters. Selecting my seat, I immediately grabbed the menu and carefully studied. 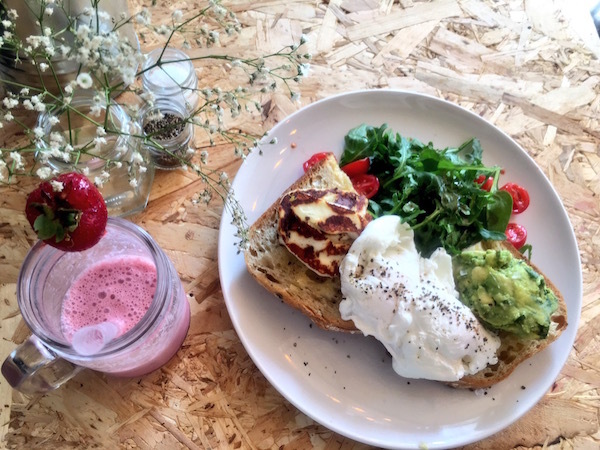 They were so much delicious selections to choose from but in the end after a painstakingly 10 minute wait, I opted for Poached Eggs, Halloumi, Guacamole, Rocket and cherry tomatoes, all washed down with Berry Boost juice. It was a meal to remember! Don’t you agree in the photo below? With prior commitments for the evening, 5pm suddenly rolled by and it was time for me to jump back on the train to London. But I was left with a HUGE impression of Hastings. I do admit that before I arrived, I was expecting an old person’s beach. But having explored this lovely town, Hastings is young, stylish, colourful and wonderfully trendy. 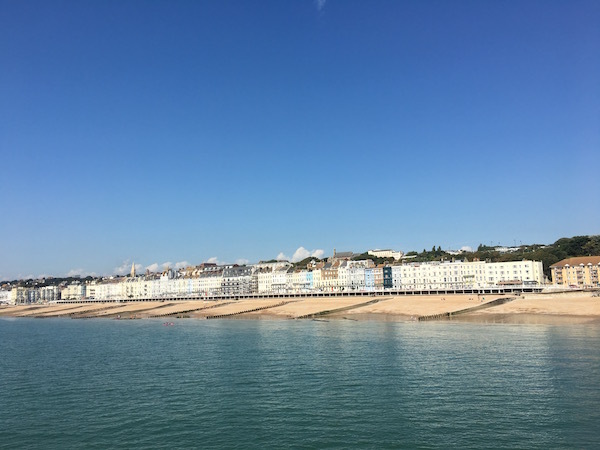 With other sights to see in 1066 country such as Battle (where the Battle of Hastings took place), I wouldn’t be surprised if I find myself back in Hastings for another turn on the pier. But next time, Boyzone will definitely be there! 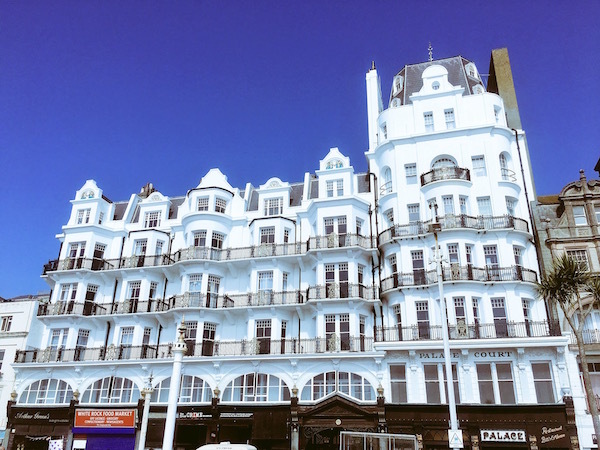 Want to find out more about Hastings?